This remote amplifier level control is used to adjust an amplifier's power level, stereo, equalizer or crossover volume form the dashboard. It adds sub-woofer level controls or balances a multiple amplifier installation. Fine tunes the volume of any RCA line level signal you wish to control. Compact housing allows the unit to be mounted virtually anywhere so control is at the user's fingertips. Simple in and out connections, no additional wiring needed. Great for a sub amp volume control. 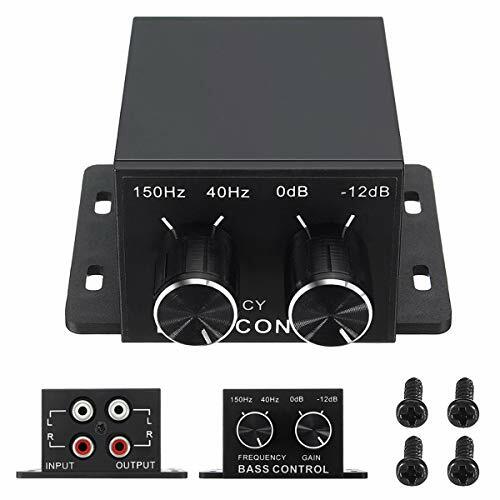 This remote bass amplifier level control is used to adjust an amplifier's power level, stereo, equalizer or crossover volume form the dashboard. Adds a Dash Mounted Subwoofer Volume Control. Simple in and out connections, no additional wiring needed. Connect the RCA from the output of this Controller to the amplifier,and wire the car stereo output to the RCA input of this unit.